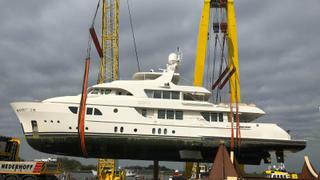 Sofia arrived at Moonen's Netherlands based yard earlier this month. Photography courtesy of Moonen Yachts. 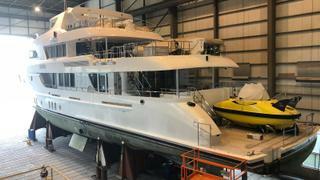 The 42 metre semi-explorer Moonen yacht Sofia has returned to her home yard for an “extensive” refit. Fresh from summer cruising in the Mediterranean, Sofia arrived at the yard’s refit facilities in Groot-Ammers, in the Netherlands earlier this month. She is set to undergo a series of refit works, including an extensive exterior paint job, demounting of all equipment and the removing of stainless steel items to allow the hull to be repainted. The refit team will also undertake a thorough inspection of the vessel to identify any additional maintenance work. The yard revealed that Sofia is set to be listed for sale following her re-launch, which is slated for March 2019. The news comes as work continues on the build of the 36 metre sister ship to Brigadoon, which launched in June. The cutting of the steel and aluminium has now begun, and the keel is scheduled to be laid at the end of October. Delivery is scheduled for spring 2020.